Proactive Advisor Magazine: Kelly, can you please describe your role at Bell Investments? Bell Bank is the largest independently owned bank in the upper Midwest, and one of the largest in the nation. Our group of wealth advisors works under the umbrella of Bell Investments at bank locations and offers access to a broad range of advisory, planning, and investment services. With the combined resources of our advisor group; the bank itself; and our broker-dealer, LPL Financial, we believe we offer highly competitive wealth-management products and services. In addition to financial planning and investments, these address areas such as corporate and individual retirement plans, trust services and estate planning, and managing philanthropic giving programs. In terms of my role, I work with clients of all ages, many of whom are customers of the bank. We believe it is very efficient and convenient for customers to be able to address their banking and wealth-management needs in one location. I primarily work on three key areas with all of my clients—bank customers or not. How I approach those areas depends on their age, years in the workforce, and contemplated retirement date. Phase one is guiding individuals or couples in their accumulation years in building a strong foundation for their retirement needs down the road. Phase two is working with clients nearing retirement and ready to address the design of a retirement-income plan. Phase three involves clients who have successfully worked through the first two phases and are now focused on wealth transfer, gaining efficiencies in tax planning for their investments and estates, and areas such as charitable or philanthropic giving programs. These distinct phases can be somewhat fluid, so we emphasize financial and investment planning that is revisited regularly and can adapt to changes in a client’s personal or family circumstances. We also work with clients to help coordinate their financial-planning and wealth-management needs with other advisors they may use, including attorneys, accountants, or another third-party resource. What are the main concerns of your clients in these three phases, and how do you address them? 1. How can I most effectively plan for retirement income and continue to have a comfortable lifestyle? 2. What safeguards can I put in place to make sure I don’t run out of money in retirement? 3. Is my family taken care of in case of my death or illness? How will our long-term health needs be provided for? 4. What are the most effective strategies for passing wealth on to my family? How can I develop a giving program to a charity or church? 5. How can my investments, and my nest egg, be better protected from the ups and downs of the market? We believe we can develop effective strategies to help our clients address each one of these issues. The last issue concerning market risk took on greater importance for clients following the credit crisis and bear market. We spend a lot of time determining an appropriate risk level for clients for their investment portfolio allocations and the blend of various investment vehicles. My goal is to turn the conversation away from “Is it a good time to invest?” I want my clients to have a good understanding of the risk present in their investment plan, the potential drawdowns their specific portfolio could face in worst-case scenarios, and the fact that we can employ strategic and tactical tools to help mitigate risk. Whether a client believes they are quite conservative or somewhat aggressive in their outlook on market risk, we work together to find appropriate risk-management parameters for their investment objectives. Our main focus is to help clients build a plan that will help them progress toward their specific financial goals—without having to take on an inappropriate amount of risk. How does the conversation about risk tend to go? We’ll talk about the experience that they’ve had investing, whether it has been good, bad, or somewhere in the middle. What are their real feelings about investing, and how have they responded emotionally and in a practical sense during troubled markets? We address time frames and market cycles, get a sense of their knowledge base, and go through an overview of what the markets tend to do from a historical perspective. We then talk about where they see things going in the future. What kind of risk should they expect, and what type of risk are they comfortable with? And we’ll talk about their time horizon—not just their experience looking back, but their hoped-for experience going forward, too. How long do they feel they could weather a severe market storm? If we were to see some serious downturn in the markets, are they prepared to handle that? How does your investment approach deal with these types of issues? Our discussion of risk naturally leads into addressing how that risk can potentially be better managed through active investment strategies. We have access through our platform to a wide variety of strategic and tactical investment approaches that we usually will use in various mixes of investment approaches. The strategy blend depends on the client’s specific objectives, their risk profile, and their time horizon. Classic growth-oriented strategies will be more appropriate for those in the accumulation phase, and a more risk-managed and active approach will likely be better suited for those making the shift over to retirement-income planning. While there is no such thing as a perfect investment solution that can provide asset growth with no risk, we think we can increase the probability of success by attempting to better manage risk, especially when markets are facing potentially severe downturns. I often use sports analogies in discussing investments with clients. One of them relates to baseball. We strive to be like a high-average baseball hitter who tends to accumulate a lot of singles and doubles, which translate into runs scored. It may not be as exciting as being the big home-run hitter, but those players tend to also have a lot of strikeouts. We would rather smooth out investment returns over the long term, working to decrease the volatility of a portfolio through the use of risk management and, if appropriate, active investment strategies. I also point out that portfolio risk management is not just a matter of overall market risk. There are other risks that should be considered, including interest-rate risk—which could become a major issue in the next few years, the risk of higher inflation on a retiree’s income planning, and the overall concept of sequence-of-returns risk. Instead of a traditional investing approach, we are looking more at how a blend of various strategies can complement each other to handle the risks that could come at any time in the future. If we can help mitigate various kinds of risk, clients are potentially that much further ahead when it comes to market recoveries or periods of growth in the market. What is the core message you want to communicate to clients about the way you serve their needs? I think it comes down to the concept of trust and having a relationship that is open and constructive. I would like clients to know that I am willing, as all of our team members are, to go the extra mile on their behalf. We strive to act in the best interests of our clients and have no financial incentives to recommend any specific financial products or services. We believe in the concept of applying prudent risk management throughout the various components of a financial plan. I tell clients that I operate as though I am sitting in their shoes. The types of strategy approaches we recommend are ones that we firmly believe will help them move successfully along the path toward their financial goals. Establish a personalized schedule for planning and client reviews. Coordinate with internal resources or trusted third parties to deliver a custom 360-degree approach to a client’s financial needs. Maintain a database of client milestone events and reach out accordingly. Follow up on any client referrals with a note or call of appreciation. Kelly Hubrig is a wealth advisor and vice president with Bell Investments, located at Bell Bank. He has 14 years of experience in the financial-services industry in the areas of insurance, retirement and financial planning, employee benefits, and investments. Mr. Hubrig grew up in southeast North Dakota, where he still lives and works today. He says his family “is very close-knit and has strong ties to the area and community, which has a great small-town feeling.” He was a member of the Hankinson (North Dakota) City Council in his early 20s and is involved in various organizations in that town and in Wahpeton, where he works. 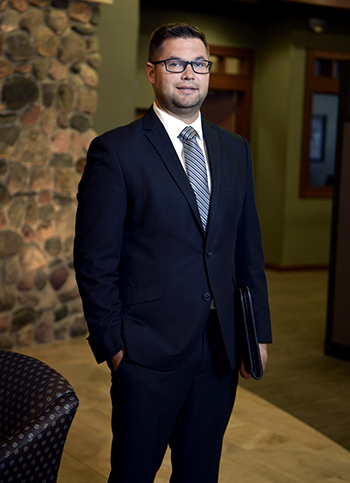 A graduate of Minnesota State University Moorhead, Mr. Hubrig majored in finance. He says he received an offer from the local office of a national financial-services firm before graduation and says he feels fortunate to have “found a profession I have a passion for at an early age.” Mr. Hubrig joined Bell Investments in 2012 and takes great satisfaction in “helping people enjoy the financial success they strive for.” He works with a variety of clients of different ages, offering planning and strategies for asset accumulation, retirement income, and wealth transfer. He is currently studying for the Certified Financial Planner (CFP) certification. Mr. Hubrig and his wife have three children, and the entire family “loves to play golf” and enjoy their lake house. 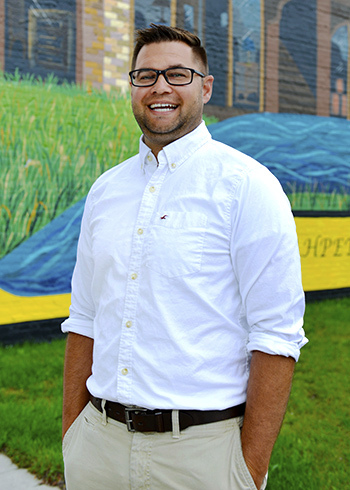 Mr. Hubrig has leadership roles at Immanuel Lutheran Church Childcare Center, North Dakota State College of Science Alumni Foundation, and the Hankinson Housing Authority. 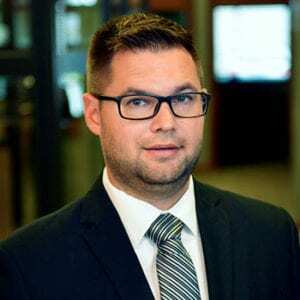 He was recognized by Prairie Business magazine in its “40 under 40” issue in 2010.